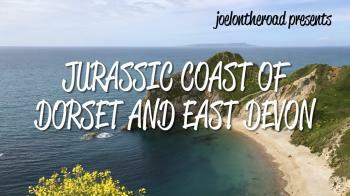 Dorset and East Devon Coast comprises 8 sections along the south coast of Great Britain that are globally important for the study of paleontology and geomorphology. Rock formations are exposed from the Triassic, Jurassic and Cretaceous era's. Great numbers of animal (marine and terrestrial) and plant fossils have been discovered here, as well as fossil dinosaur footprints. They include Dimorphodon macronyx, one of the earliest flying reptiles, and Scelidosaurus harrisoni, the "Charmouth dinosaur". Geomorphological fields of study include a great variety of landslides, and beach formation and evolution on a retreating coastline. 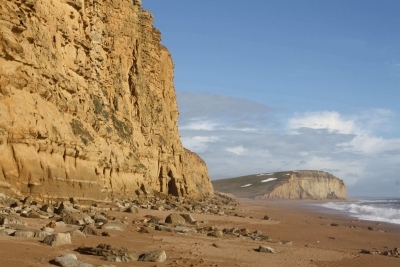 Chesil Beach for example is one of the best-studied beaches in the world. And the Fleet Lagoon, enclosed by Chesil Beach, is one of the most important saline lagoons in Europe. 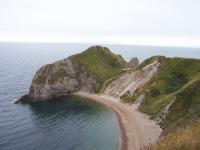 The site shows excellent examples of landforms, including the natural arch at Durdle Door, the cove and limestone folding at Lulworth Cove and an island, the Isle of Portland. I was nine, when I visited Dorset with my parents. 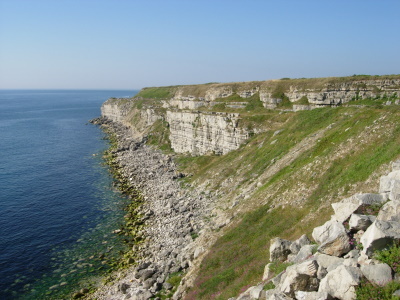 The pictures show the cliffs and caves, Storhead (a park? ), a swannery and me with a monkey on my shoulder. What I remember (not on the pictures): eating fishsticks day after day, and playing with the children of the owners of the Bed & Breakfast we stayed in (I became a member of their Puffin-club). I was quite taken by the Dorset Coast. We spent there two days and could have easily spent more. Our first walk was to Old Harry Rock. Beautiful white cliffs (chalk is the youngest layer of the Jurassic coast's time line), not as high as Dover but purer white. We parked the car in Studland, walk east along the north shore of the peninsula and returned over the ridge. It is not clearly indicated and your have to enter a fenced meadow but you have a nice view in both bays and can easily descend over the fields downhill when you are on the hight of Studland. Our next stop was the famous Lulworth cave. 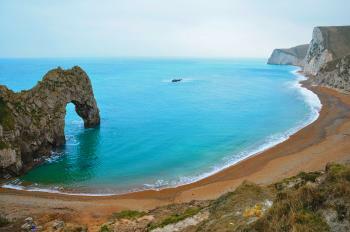 There are two possible walks from there to Durdle Door. One over the hills which is a bit steep but easy and one along the beach which is officially closed due to land slide. It is doable nonetheless though not well marked: You can walk up Britwell Drive, descend from there to the shore. You walk a while along a stony beach (good shoes) and then comes a short section where you have to walk partly on the rocks and partly in the water, a bit adventurous but fun. Don't do it if you are not secure on your feet or with small children. After that comes the landslide part which is really easy when it is dry but possibly difficult after rain. From there we took the hill path back. Lime Regis is not included in the natural WHS but a very nice town despite the tourists. and a few kilometers west is the famous Fossil Beach that is not directly reachable by car. Our last walk was at Ladram Beach with very nice - and older - red rocks. The most interesting part here is not the main bay where everybody swims but the next bay to the east that you can see from the top when you follow the SW coast path a few hundred meters to the east. As much as the often quite spectacular coast I enjoyed the drives between the beaches. They follow almost never the coast directly but wind though the (not included) hinterland. They are often narrow with trees and bushes on both sides which often form tunnels. There are incredibly cute villages with thatched roofs. They are lovingly well-kept and reminded me a bit of Hobbits. Some villages have additional attractions: In Corfe Castle there is a huge castle ruin (National Trust) and in Kimmeridge is the excellent Etches Collection which displays basically a single mans lifework of finding dinosaur bones. March 2018 - After our visit in Stonehenge and Salisbury (on 5th of March!) we finally wanted to cut the coast somewhere. We went to Westbay and had a long walk along the cliffs. Unfortunately this was our only real encounter with the world heritage coast, but it was quite amazing. You could see the Isle of Portland and to the other side up to Torquay. Many seagulls were nesting in the cliffs and even more people walked their dogs along the coastline. The weather was perfect that day, so the view was magnificent and the whole experience well done! 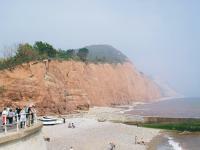 We made another stop at Seaton, but not as intersting as the coastline in Westbay. Several other spots including the rock stacks near Durdle Door we had to skip, partly for time but also because many places charge 5 pounds or more for parking! See below for my full video review. Walking along the beautiful coastline of white chalk cliff between the Lulworth Cove and the natural arch of Durdle Door was probably one of the highlight of my England trip. Originally not part of my first plan, but I decided to visit this place after saw picture of the Durdle Door on Wikipedia, at that time I hardly believed that the place was in England. Travel without own vehicle was the real pain in the area especially in winter, from Wool train station there were infrequent bus connect the town to the village of West Lulworth, but the schedule was not so friendly to leisurely sightseer, at the end I decided to take taxi to Durdle Door and walk back to Lulworth Cove for better bus connection. Taxi took me to some kind of campsite with many small summer houses in the middle of green rolling hills, the driver said this place was the most convenient to see the famous natural arch, and true to his words, after walking downhill I started to see the coastline with stunning turquoise water of Atlantic. Then I saw the headland and a cove, the one on the photo of Ian Cade’s review, called Men O’ War Cove, the view was pretty lovely, I continued along the pathway to see the viewpoint where with my surprised, I saw the Durdle Door! Actually I planned to walk on the beach in Durdle Cove, but the access was closed with warning sign of danger, so I had no chance to see the Durdle Door closely, but the view of the area was really great. I looked at the coastline and saw that the chalk cliff is melting into the ocean, a sign that erosion from the ocean is still continuing and one day the cliff I saw will be gone. After Durdle door, I tracked back to Lulworth Cove to see its almost perfect circle cove, the area was again a lovely place but with more tourist facilities. After leisurely walk in the area, I took a bus back to Wool Station before continued my trip to Stonehenge. I was quite surprised to know that the area was called Jurassic Coast for its abundance of fossils; so this was the second fossils site place I saw after Monte Giorgio on Italy and Switzerland border. However, I could not find anything in the area to emphasize the fossil; all information was about stunning geology or do I misunderstand something about the place? For me the coastline of Dorset is a lovely place to visit for its landscape, and it is more interesting than the one in Dover. I also found extensive views of Chesil Beach from the causeway near Weymouth and from Littlesea. The quarry area on Portland bill was very interesting too, with the cut stones ready to be lowered into barges, long since discontinued, for tranport and use in many London buildings. 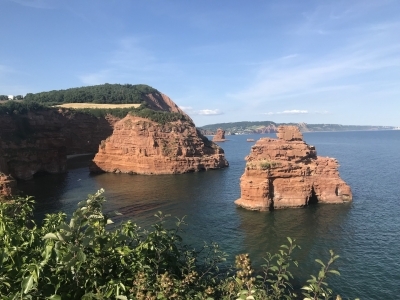 Other interesting features along the cast were the cliffs at Bowleaze Cove, the red cliffs of Sidmouth and the Devon Cliffs at Exmouth. I really quite enjoyed my trips to this piece of coastline, I have visited pretty regularly having family days out here when I was very young, but I have also made two trips to specifically tick it off as a visited site. The reality is actually a little more interesting and you don’t have to be a budding geologist to have a nice trip here. I visited the part of the coast stretching from the almost completely circular Lulworth Cove along to the Durdle Door (which is just the other side of the headland in the picture). It is a really nice walk, giving you a bit of exercise and fresh air as well as the ‘Highlights’ of the coast, well for the non expert anyway. Unfortunately after a few hours spent breaking open any rock we could see we were not able to uncover any fossils, but apparently this is one of the best places in the Europe to do it. The little village of Lulworth has a great visitor centre and a fine fish and chip shop so makes a nice place to start and end in. And for those that share my silly obsession of finding the World Heritage symbol on a plaque then just to the west of the cove there is a really fine example of the symbol and the reasons for its inscription! There are lots of lovely little towns and villages all along the coast, replete with B&B’s, campsites and small hotels, or if you wanted just a day trip to the coast the best place to base yourself would probably be Bournemouth which has a nice seaside charm, it also sits on the edge of the New Forest which is on the UK tentative list and has an airport used by budget airlines! The coast is a nice place to get a dose of fresh air and rewards even the non experts who visit it. The views of Durdle Door and Portland Bay from the cliff tops are quite something and the walk down to the beaches at Durdle Door is certainly worth the effort. On a hot day the sea is so inviting and clean and on a stormy day, the atmosphere is simply electric. I'm delighted to see that you have listed the spectacular Dorset and East Devon coastline so quickly and that you have visited this beautiful part of the world. More information on this coast can be found on www.jurassiccoast.com and information on the area can be found on www.westdorset.com The swannary is in the beautiful village of Abbotsbury on the Dorset coast. The famous Chesil beach, a major feature of this World Heritage Site, is best viewed from the hill above Abbotsbury village. Lagoons: The body of water behind Chesil Beach is called "The Fleet Lagoon"
Napoleon was here: There is a story that Napoleon was seen landing in 1804 at Lulworth (to inspect it as an invasion beachhead), Thomas Hardy later writing a poem and a short story about these incidents. European Diploma of Protected Areas: That part east of Weymouth as "Purbeck Heritage Coast"
200 Community Members have visited.